The long-envisioned Brush Creek Trail should be ready to ride, walk and run before the month is out. A new bridge, placed across Brush Creek near the edge of Snowmass Village on Wednesday, is among the final touches on the $1.3 million project to link the town to Highway 82 through the scenic valley. “The town is very excited; I’m very excited,” said Mayor Doug “Merc” Mercatoris. The trail has been a town goal since the late 1990s, when Mercatoris, then a town councilman, and former Mayor T. Michael Manchester negotiated a conservation easement with the Droste family, one of the private landowners in the hilly, sage brush-covered Brush Creek Valley. Construction of the trail, a Pitkin County Open Space and Trails project, was put off each of the past two summers to accommodate utility work in the corridor. 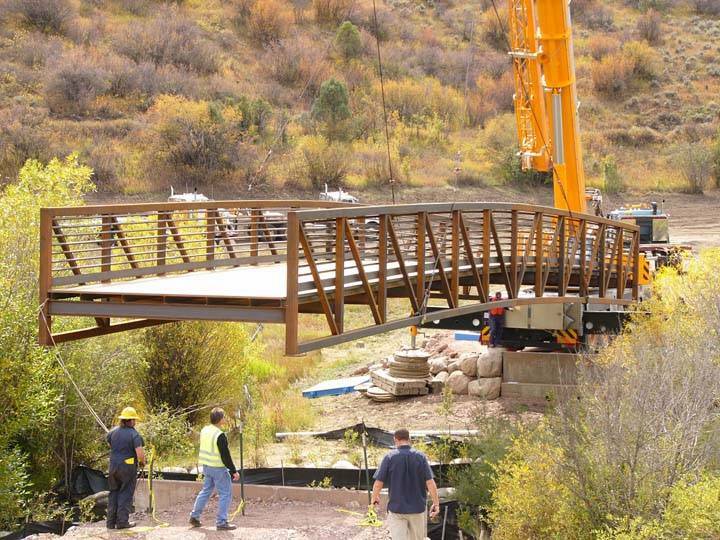 The Open Space and Trails program picked up the tab for the project, though it split the cost of the $68,000 bridge with Snowmass Village, said program director Dale Will. A second bridge was planned ” a segment of the dismantled Maroon Creek pedestrian bridge was to span Brush Creek near Cozy Point. Instead, the trail uses a driveway box culvert shared with a private property owner to cross the creek, Will said. In addition to the trail work, Pitkin County has spent some $9 million preserving open space in the Brush Creek corridor, while the Town of Snowmass Village has spent another $5 million on open space efforts there, Will noted. “It’s a way for the public to enjoy all of this open space now,” he said. Will said he hopes to see the trail open to use by the middle of next week at the latest. The 3.3-mile trail ends at the new roundabout at Highline Road in Snowmass; next summer, the town hopes to complete the link to the existing town trail system, Mercatoris said. Until then, bicyclists will have a short ride on Brush Creek Road between the roundabout and the trail in place alongside the Snowmass golf course. On the lower end, at Highway 82, a highway underpass provides a link to the Aspen Mass Trail, which links to Jaffee Park near Woody Creek and the Rio Grande Trail. The Brush Creek Trail means a more convenient link to Snowmass from downvalley and creation of a loop linking Aspen and Snowmass via the Brush Creek, Rio Grande and Owl Creek trails. “Most importantly, you won’t be riding 6 inches away from the traffic on Brush Creek Road,” Manchester said. The winding road offers no shoulder for bicyclists and pedestrians. About two miles of the Brush Creek Trail includes an 8-foot-wide paved surface, plus a 6-foot-wide soft surface. About a mile across the Droste property only accommodates a 10-foot-wide paved surface and equestrian uses are not permitted there under the agreement with the Drostes, Will said. The Owl Creek Trail is also paved, but a section of the Rio Grande Trail between Woody Creek and Aspen is hard-packed gravel.